I’ve met some interesting people on this holiday, from the gentleman giving away lettuce, by the yard; to the fastidious Technicolor workman, so I was intrigued to see a man just outside the door of our holiday let who appeared to be making a detailed drawing of a road cone, curious I had to take a closer look, I was in for a treat the subject matter of his concentrated effort wasn’t a road cone. 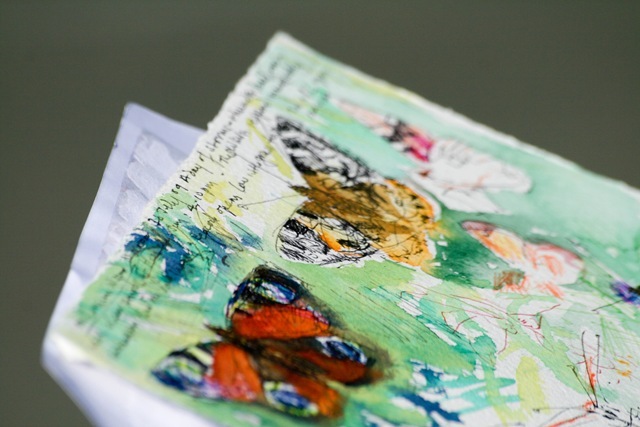 But not only that, he can paint exquisitely, he told me butterflies were his usual subject and showed me some of his work. A couple of children came to see what was going on and he kindly showed them how to let her walk on to their hand. Dad, can I be an entomologist when I grow up? the boy remained as cool as a cucumber whilst she walked up his neck and into his hair. The artist, David Measures has several books published of his work (you can see and buy his paintings here) one of his favourite locations to work is Cressbrook Dale in Derbyshire and he is having an exhibition at Derby Museum and Art Gallery from the end of January-March, dates to be confirmed, so I can go and see some more, what a treat. Categories: Away Days, Derbyshire, Devon, Education, Environment, Field studies, Insects, Nature, Photography, Thoughts, Travel | Permalink. very nice and beautiful photos , keep it up. What an exquisite experience. Thanks for sharing. What a beautiful creature. I have never seen one that big and would very much like to. I am glad the boys were interested when so many people today think insects and similar species are for stamping on. 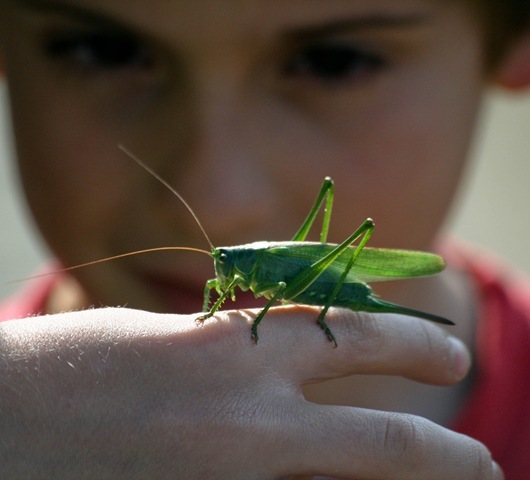 Maybe the boy will become an entomologist: our life’s choices are often decided by such experiences. What a wonderful story–and how beautifully those photos tell it. I think this is some of your very best work. I predict the young man in red will grow up to Find Things Out. I wish him well at this important job. Wow – he’s rather beautiful isn’t he? I often hear them chirping away, but I don’t think I’ve ever managed to spot one. I am really enjoying your holiday! Going back to the sketching done by the lady drawing the thatched house ~ one thing I loved about your black and white photo was seeing the pencil she was using….it was an art object in itself. No fancy pencil sharpener for her, but it was sharpened by hand, probably with a pen knife! I meant to comment at the time of your posting, but I’ve been away. I am glad you take the time to talk with these fascinating people ~ and share such varied photos and info. 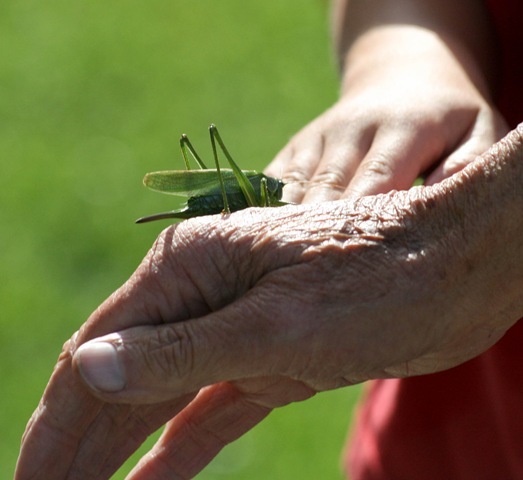 Interesting how the large grasshopper has reappeared and has now been ‘pictured’ for posterity. Thanks for the links. Sounds like you are continuing to have a wonderful time. A lovely story, thanks for sharing it and the photos. ……it looks very much like the yinormous crickets I was seeing in France. 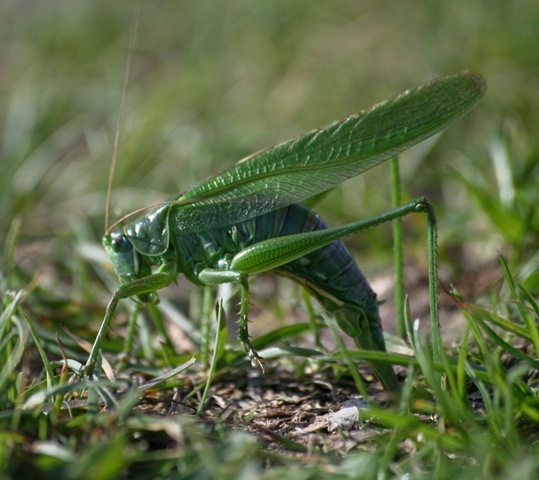 Its long antennae suggest a cricket rather than a Grasshopper to me, the Great Green Bush Cricket perhaps? What a fantastic post! I think we all shared your excitement with these findings. 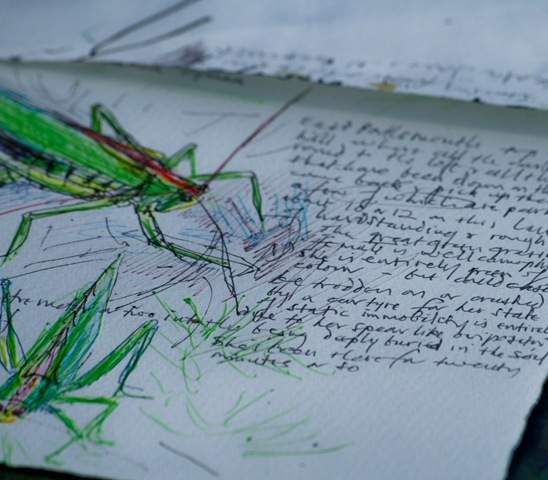 There’s the same grasshopper – there’s someone who knows what it is – and there’s a link to his exhibition, which is just down the road from you! Co-incidences piled up together till you couldn’t help falling over them in a happy heap! Wonderful stuff. Brilliant artists – the painter and the photographer. 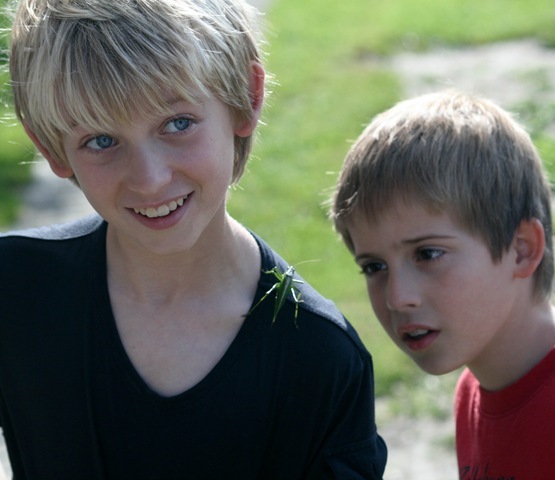 I would not remain cool with a grasshopper going in my hair. I would be shrieking like a little girl. What an interesting, and informative, post! Truly something special – what wonderful sketches, and I love the way you have told the story with your images. 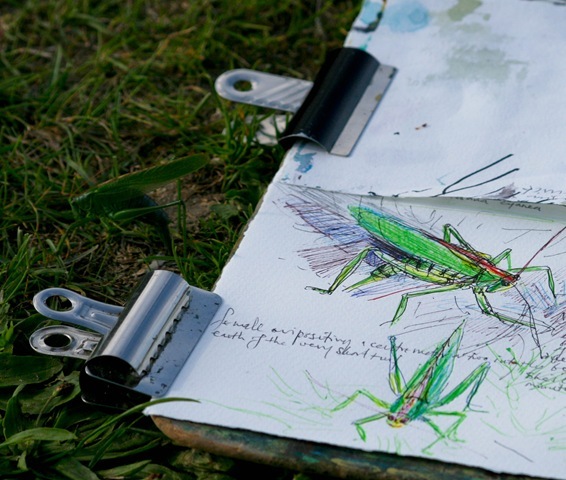 Children, nature and art… The perfect mix for joy and discovery on a summer afternoon. You’ve woven all the elements beautifully together with your photos and words. I would be in heaven if I could draw like that, UHDD. Seriously. Actually, I’d want to color everything he drew! 🙂 I love it.